Owning a swimming pool certainly comes with many benefits and enables you and your family to have countless memories. However, pool ownership comes with many responsibilities for proper maintenance and longevity, and cleaning should really be done on a continuous basis. Here are five really easy tips at helping you keep your pool in great shape using commonly-used household products! While there are many products readily available to clean your swimming pool, always be sure to properly test your water before anything else. Testers can be purchased via online or in many home improvement and pool stores. Be certain, too, that the chemicals you use are proper for your pool and that any mixtures do not cause any unwanted conflicts. A sodium bi-carbonate, baking soda works great at raising the alkalinity of the water. To increase the levels by 10ppm, use approximately 1.5 lbs of baking soda for every 10,000 gallons of water in your pool. Bleach works well at shocking the pool. If you have hard water, bleach can help reduce the calcium in the water. To increase the chlorine levels by 5ppm, use approximately one-half gallon of bleach for every 10,000 gallons of water in your pool. If the pH levels are low in your pool, borax is great to increase this to a proper level. The variation used will depend on your pH levels, but one-half cup of borax to 10,000 gallons is suggested. Borax can typically be found in most stores in the laundry products aisle. Make sure there are no allergies to borax before using. If the alkalinity in your swimming pool is on the high side, using muriatic acid can help reduce the levels. A wide push broom works wonders when you need to clean away debris, such as grass, leaves, or pine needles. A multi-surface broom is certainly great at cleaning debris on the pool deck, but also pushing the debris to one corner of the pool within the water, and then using a vacuum to remove it. Professional residential landscape design is our specialty. Leave it to the experts. You’ll be with us every step of the way to help design your perfect yard. 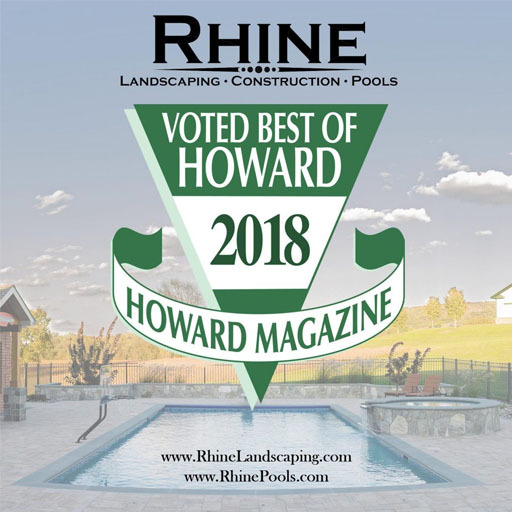 To get started with yourlandscaping cleanup or swimming pool project, contact Rhine Landscaping by calling 410-442-2445 or click here today!